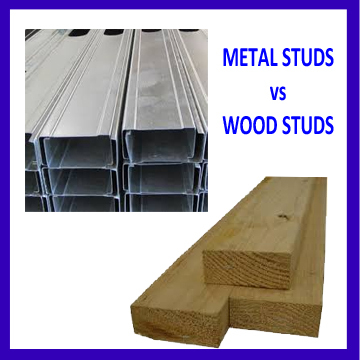 Interior Partition Wall Steel Studs VS Wood Studs: Which Is Better? Often, when I am doing a remodeling job, I am asked why am I using steel studs instead of wood studs. Although the price may be slightly higher, the real costs can be lower – and that is better for you! There are some nuances to this area. Steel framing can cost three to 15 percent more than wood studs, based on Steel Framing Alliance calculations, but metal studs offer cost advantages in other areas that can offset this price difference. Steel does not shrink, split or warp. As a result, there are no nail pops or drywall cracks to fix after the structure is completed. Consistent quality means that scrap is drastically reduced (two percent for steel versus 20 percent for wood), which also reduces costs for hauling off and disposing of discarded material. With wooden studs, you have to worry about problems like rotting, warping, shrinking, cracking and splitting. Termites, other insects and mold can also quickly destroy wooden studs under the right conditions. Finding quality lumber to use as studs can also be difficult; it varies widely depending on where the wood is grown. Lumber also has to be sorted carefully and you can’t use any pieces that aren’t straight or have knots, cracks or other imperfections. As much as 20 percent of the lumber bought for studs ends up wasted, and since wood prices can fluctuate, trying to budget for a construction project is challenging. Metal is lighter than wood. Steel framing is easier to handle because the studs weigh a third less than wood and can be installed at 24 inches on center. They take up half the space of lumber because of its hollowed shape. This makes for easier transporting and storage. Metal studs can be cut with aviation snips, which means no sawdust. They also are attached with screws, so moving studs is simple if you make a mistake. Wood is prone to twisting and warping; metal is not so walls are straighter. Wood also wicks moisture, which can lead to mold growth and rot, while metal is immune. Metal studs are made from recycled metal – they could have been a car fender in a previous “life”. Once a tree is cut down, it’s gone. It takes years for a new one to grow in its place. Knowing your what materials are better for your home remodeling projects will add value to your investment. “Cheaper” is not better, you need to know the true costs. If you are considering a home improvement project or you need some maintenance advice, contact your local certified “roomologist”, Leading Edge Homes. Inc. at 561-795-2551.